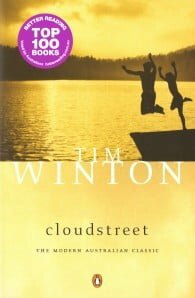 From separate catastrophes two rural families flee to the city and find themselves sharing a great, breathing, shuddering joint called Cloudstreet, where they begin their lives again from scratch. For twenty years they roister and rankle, laugh and curse until the roof over their heads becomes a home for their hearts. Tim Winton’s funny, sprawling saga is an epic novel of love and acceptance. Australia’s Top 100 Favourite Homegrown Reads, ABC’s My Favourite Book 2004, Miles Franklin Literary Award – Every Winner Since 1957, Better Reading Presents Australia’s Top 100 Books for 2015, Better Reading Top 100: The Top Five Aussies, Staff Picks: Our Favourite Top 100 Screen Adaptations, Top 10 Must-Reads this Australia Day Weekend, Better Reading Presents… Australia’s Top 100 for 2016, Top 100 2016 Aussie Authors!